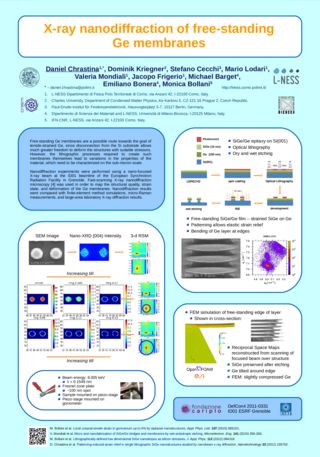 M. Bollani, D. Chrastina, L. Gagliano, L. Rossetto, D. Scopece, M. Barget, V. Mondiali, J. Frigerio, M. Lodari, F. Pezzoli, F. Montalenti, and E. Bonera: Local uniaxial tensile strain in germanium up to 4% by epitaxial nanostructures, Appl. Phys. Lett. 107, 083101 (2015). V. Mondiali, M. Lodari, D. Chrastina, M. Barget, E. Bonera, and M. Bollani: Micro and nanofabrication of SiGe/Ge bridges and membranes by wet-anisotropic etching, Microelectron. Eng. 141, 256 (2015). M. Bollani, D. Chrastina, M. Fiocco, V. Mondiali, J. Frigerio, L. Gagliano, and E. Bonera: Lithographically-defined low dimensional SiGe nanostripes as silicon stressors, J. Appl. Phys. 112, 094318 (2012). D. Chrastina, G. M. Vanacore, M. Bollani, P. Boye, S. Schöder, M. Burghammer, R. Sordan, G. Isella, M. Zani, and A. Tagliaferri: Patterning-induced strain relief in single lithographic SiGe nanostructures studied by nanobeam x-ray diffraction, Nanotechnology 23, 155702 (2012).